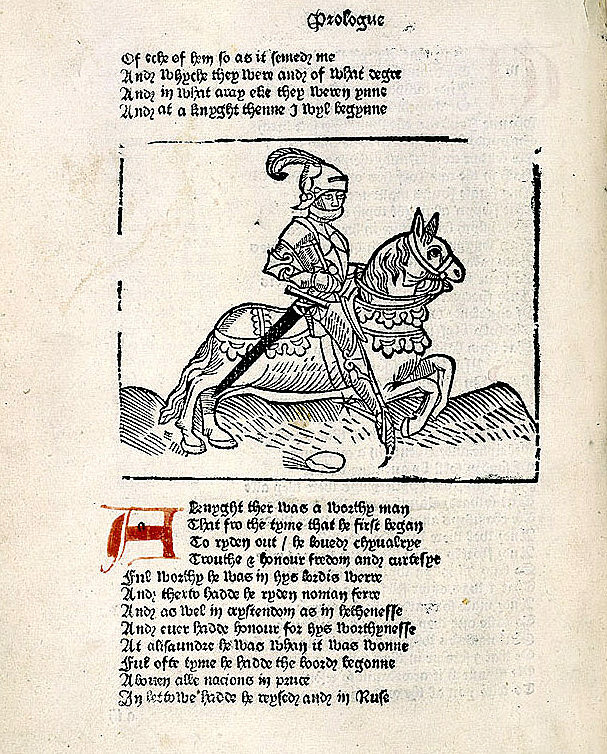 Cropped leaf from the “Ellesmere Chaucer” MS., c. 1400-1405, Huntington Library; page from William Caxton’s 1483 edition, British Library; 1561 edition printed by John Kingston for John Wight; a 1634 theatrical adaptation of the Knight’s Tale by John Fletcher and William Shakespeare; “Chaucer’s Canterbury Pilgrims”, engraved and published by William Blake, 1810; Illustration by Edward Burne-Jones for the “Kelmscott Chaucer”: The Works of Geoffrey Chaucer, now newly imprinted. 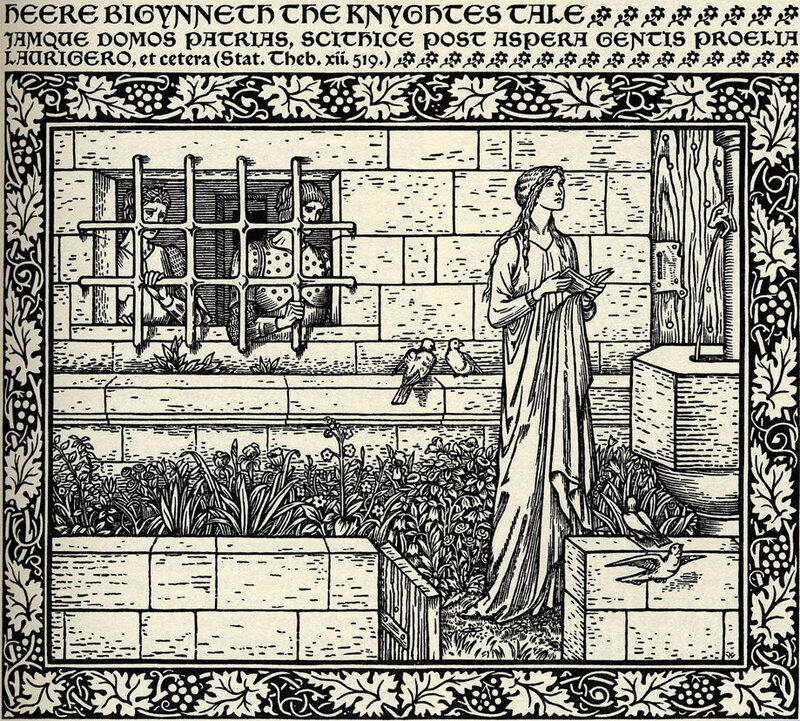 Kelmscott Press, 1896; Illustration by William Clark Appleton from Percy Mackaye’s The Canterbury Tales of Geoffrey Chaucer. 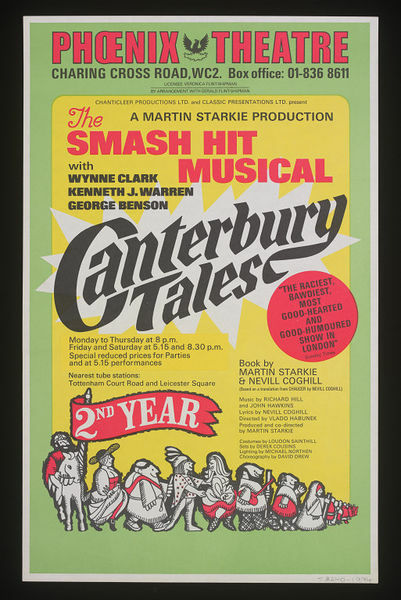 A Modern Rendering in Prose, of the Prologue and Ten Tales, New York, 1904; Poster for the “bawdy” musical, 1968, Victoria & Albert Museum; Penguin Clothbound Classic cover by Coralie Bickford-Smith, 2013. 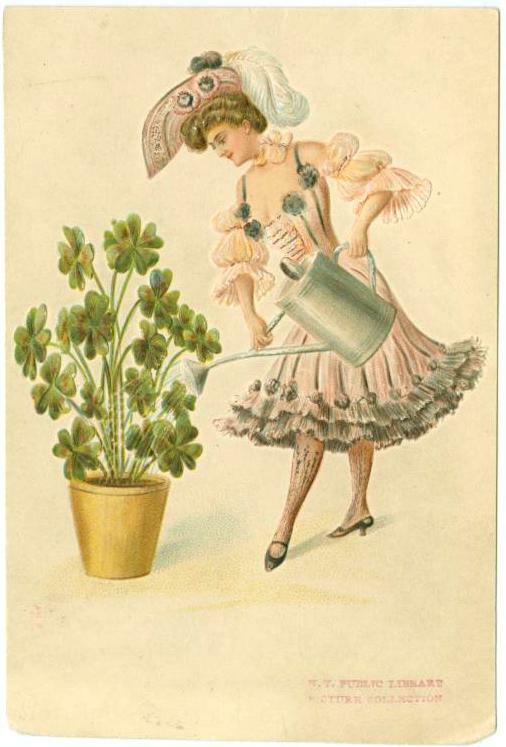 I was going to do a rather straightforward post on the shamrock for St. Patrick’s Day, but it turns out that there is nothing straightforward about this plant, but rather an age-old confusion about what it actually is/was. The history of the shamrock and its association with Ireland is misty and murky: if indeed St. Patrick plucked a tender three-leaved (trefoil) sprig of some sprawling plant to illustrate the Holy Trinity we don’t know what that plant was, nor do we know precisely what plants Elizabethan authors like Edmund Campion and Edmund Spenser were referring to when they referenced the “wild” Irish eating shamrocks. 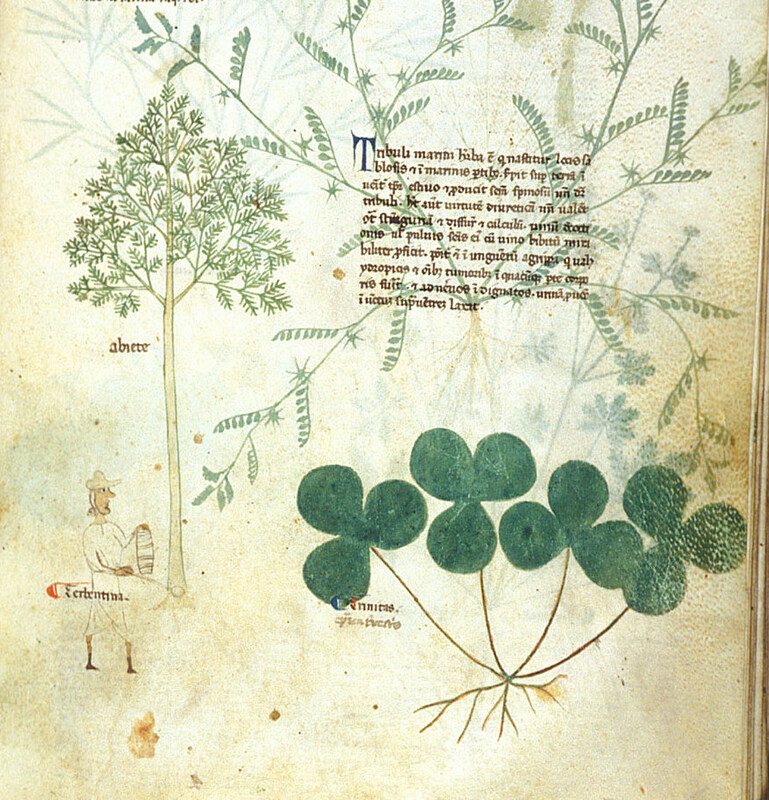 The general consensus is that the word is derived from the gaelic seamróg, a diminutive form of seamair, meaning “clover”, but there is no botanical consensus that the shamrock is a clover variety: opinion seems to have been divided between various varieties of clover (trifolium) or wood sorrel (oxalis) for quite some time, with a weed called medic (medicago) mentioned occasionally as another candidate for the shamrock label. 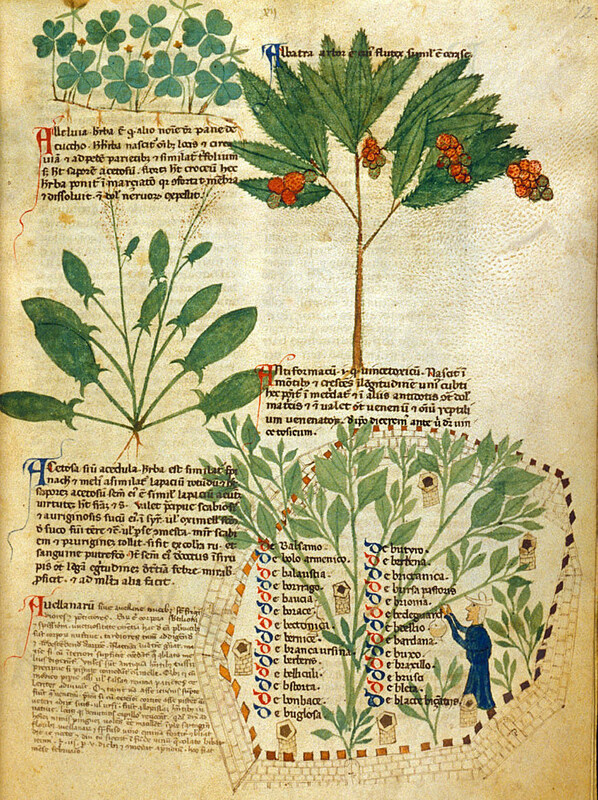 If you look at illustrations of the first two plants in one of the most lavishly illustrated medieval herbals, the Tractatus De Herbis (British Library MS Egerton 747), you can understand the confusion between these two look-alike, supposedly sacred plants. 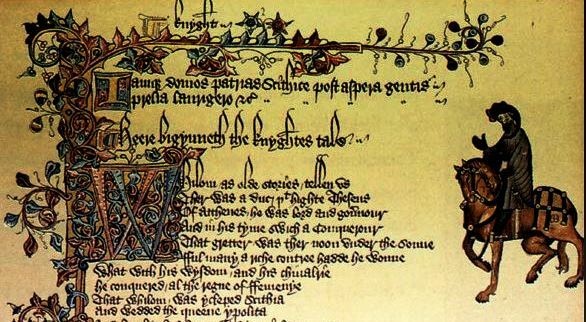 Clover (also called “Trinitas”) on the lower right and Wood Sorrel (also called “Alleluia”) on the upper left in BL MS. Egerton 747, c. 1280-1310. The other source of confusion, much more modern and almost-exclusively American, I think, is between the shamrock (whatever it is) and the four-leaf clover. Both might be clovers, but if you embrace the trinitarian nature of the former, you can’t also have the secular charm of the latter–or can you? Americans seem to want it both ways, and consequently they fashion a St. Patrick’s Day holiday that combines a bit of faith and fortune, and much, much, much more fortification. 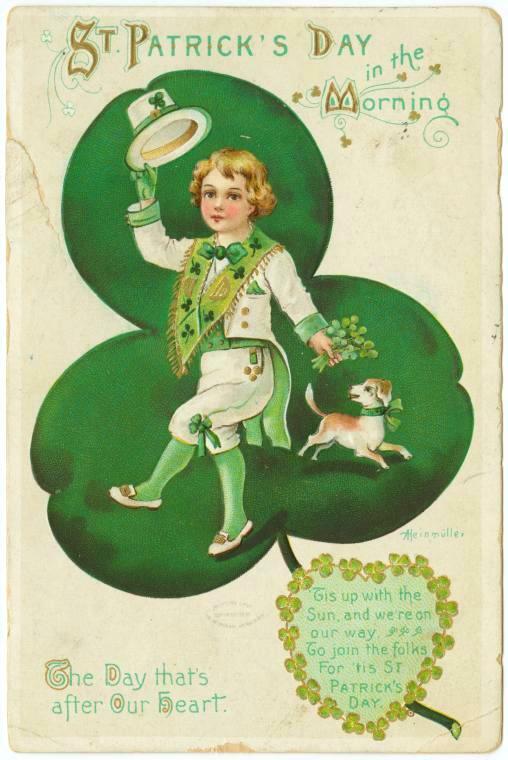 St. Patrick’s Day postcards c. 1906-11 from the New York Public Library’s collection: a trefoil shamrock, four-leaf clovers, and both on one card. 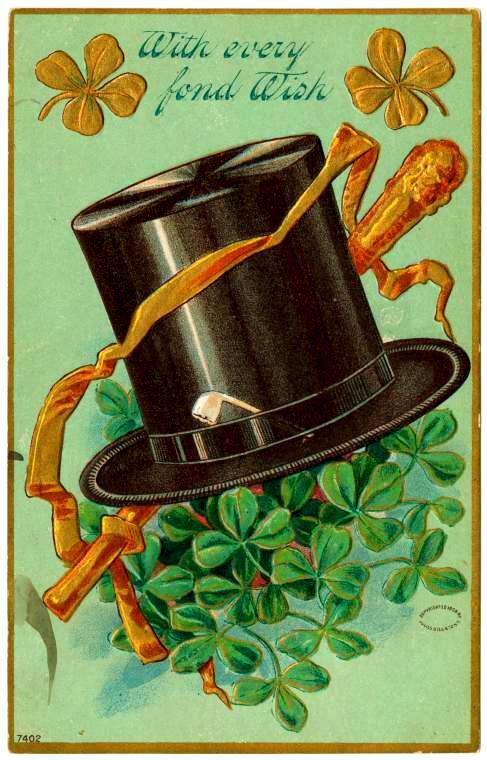 There is much less confusion about how the shamrock (whatever it is) became inextricably identified with Ireland: this was much more a Victorian development than a medieval or early modern one. 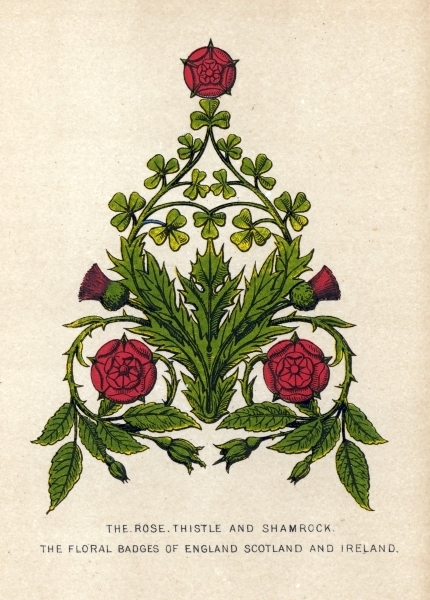 In the visual culture of the Great Britain, the Irish shamrock looms large, along with the English rose and the Scottish thistle (and occasionally the Welsh leek). 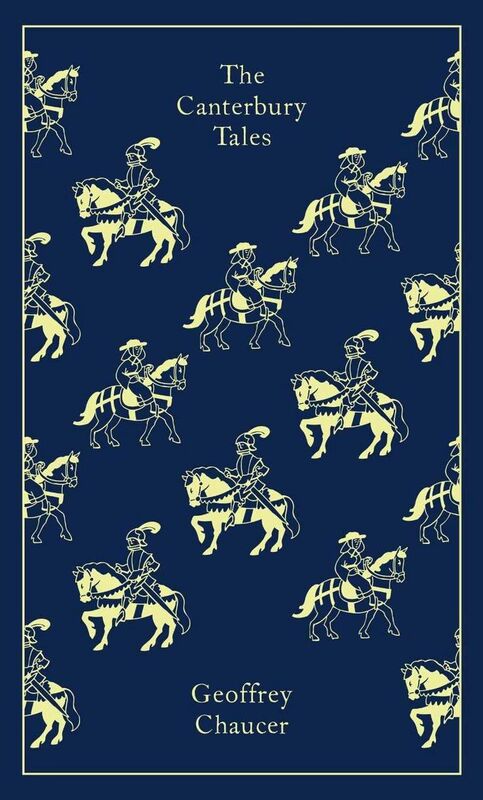 These symbols appear together on all sorts of items–textiles, pottery, wallpapers–as both official “Arms” of the United Kingdom, decorations for royal palaces and personas, and patriotic embellishment. 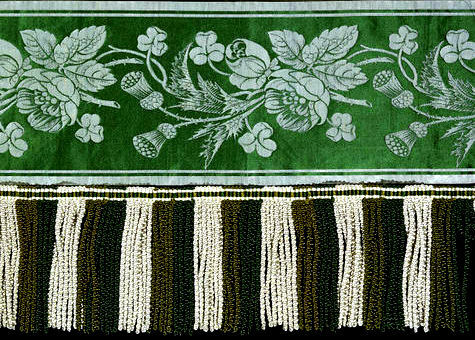 James King design for the National Arms of Great Britain, c. 1890; Norris & Company silk curtain border design for Windsor Castle, 1850s; C.F.A. 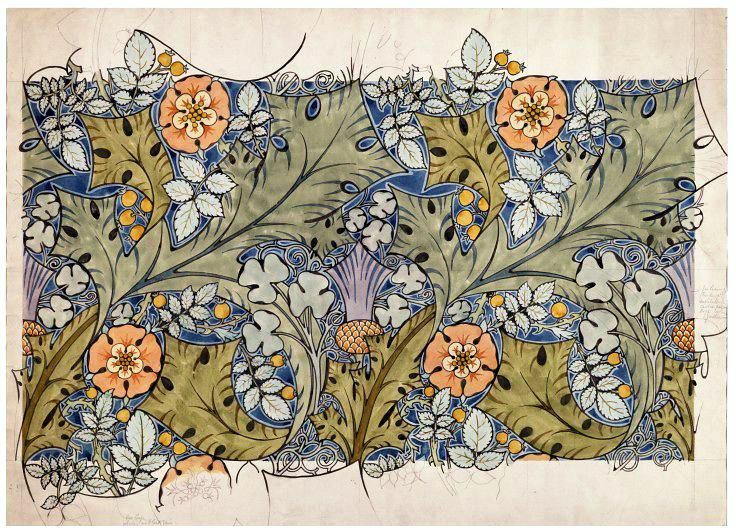 Voysey textile design with garland of Tudor roses, thistles and shamrocks, c. 1915, Victoria & Albert Museum Collections. These integrative designs are interesting aesthetically and politically, but you can’t beat a single shamrock (whatever it is), especially if it is made up of diamonds! Paired, perhaps, with a companion four-leaf clover brooch for extra luck. But even if there are no sparkling stones, a bright green shamrock (like the holiday it has come to represent) represents hopefulness and gaiety in the often murky month of March. 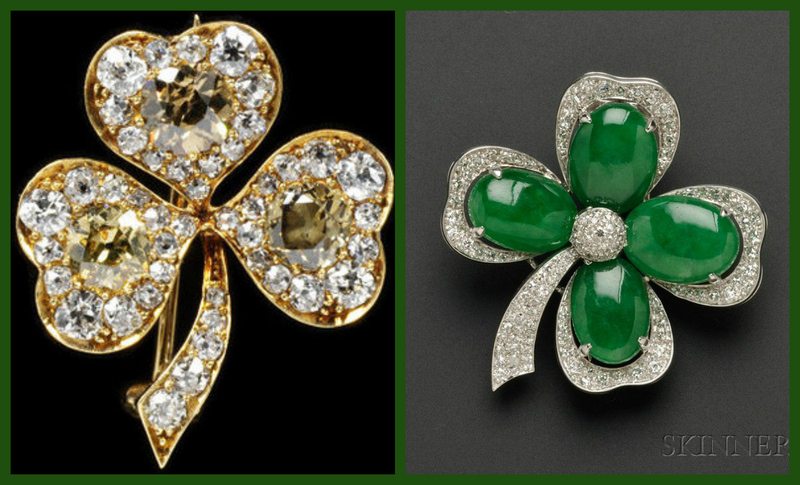 Diamond shamrock brooch, c. 1890, Victoria & Albert Museum; Art Deco platinum, diamond and jadeite clover brooch, c. 1935, Skinner Auctions; Ullman Manufacturing Co. calendar page for March, 1906. Supposedly the word “ides” refers to the middle of the month, any month, but we never hear about the “Ides of July” or the “Ides of October”. 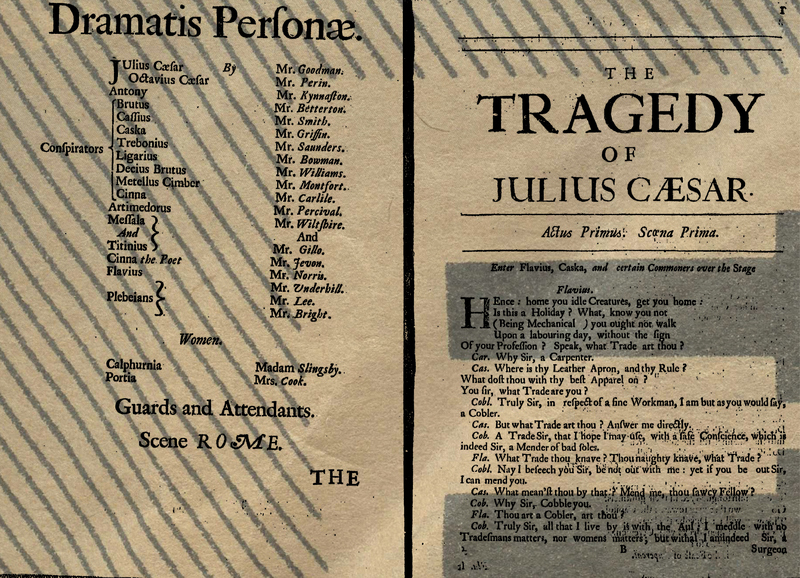 We only hear of the Ides of March in reference to the assassination of Julius Caesar on March 15 in the year 44 B.C., a conspicuous date because of Shakespeare and his sources (primarily Plutarch). 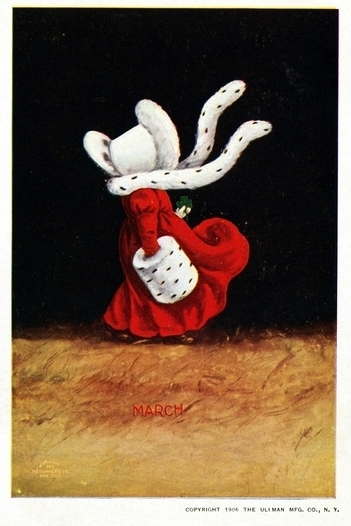 Beware the Ides of March says the soothsayer to Caesar, but he did not, or could not. 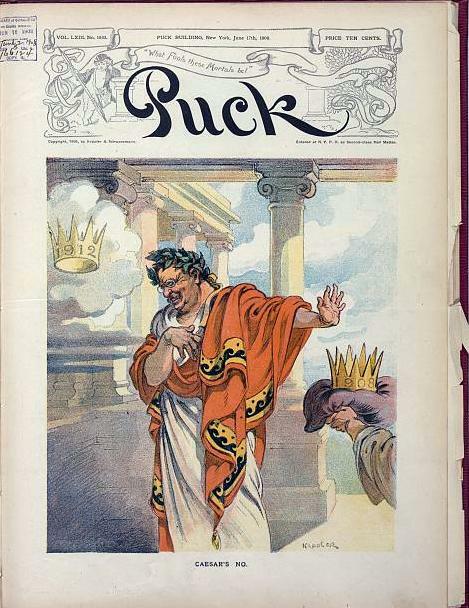 In somewhat of the same way as we would use the phrase 9/11, the phrase was used afterwards to refer to the cataclysmic event and its impact: Caesar’s murder and the consequential (though short-lived) restoration of the Roman Republic. But Julius Caesar was also remembered as a martyr by some, and a brilliant commander and conqueror by all (I do not remember him fondly in this capacity, having struggled for so many years with Latin lessons based on Caesar’s Gallic Wars). 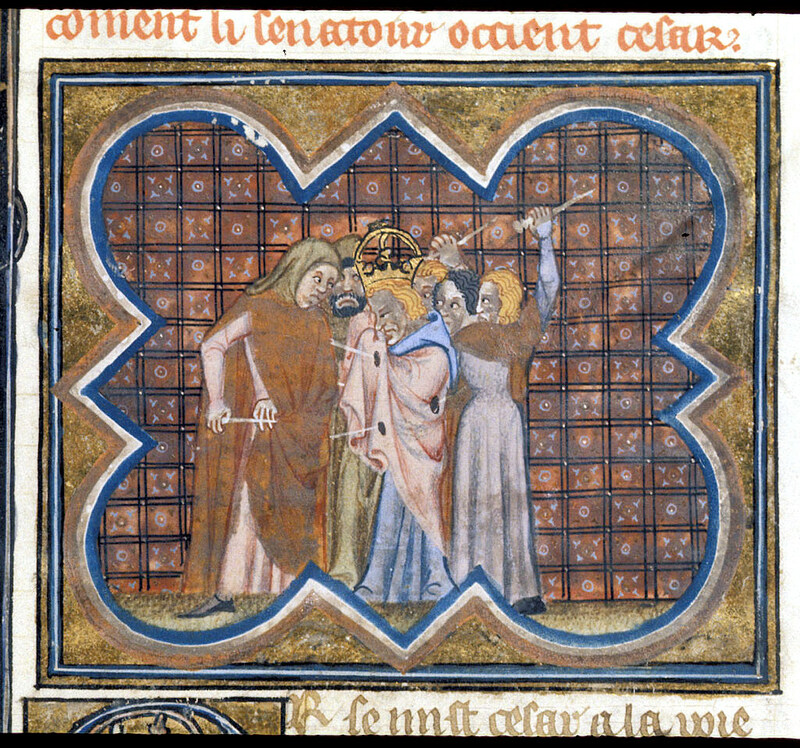 I always find it interesting to see lavish medieval manuscripts devoted to Caesar’s life and death. 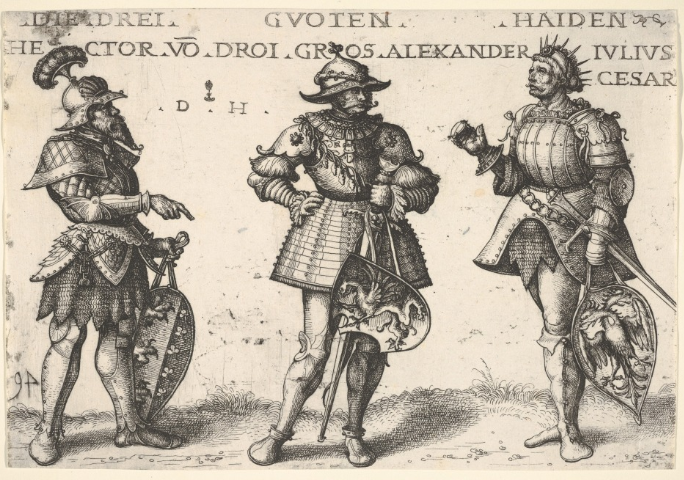 There is a noticeable emphasis on his birth (giving rise to the myth that he was the product of the first “Caesarean section”) as well as to his military exploits: like Alexander the Great, he becomes an “acceptable” pre-Christian hero. 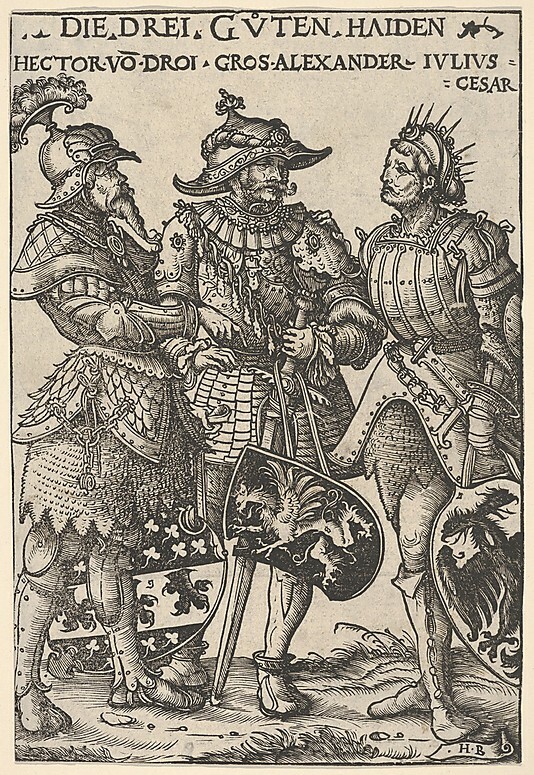 A bit later, he is always found among the “three worthy pagans” or “three heroic heathens’ of Renaissance histories. The medieval Ides of March, from British Library MS Royal 16 G VII, 14th Century(Les anciennes hystoires rommaines (A compilation of ancient history in two parts); and the Renaissance Caesar in Daniel Hopfer’s “Three Worthy Pagans: Hector, Alexander the Great, and Julius Caesar”, c. 1516, and Hans Burgkmair’s “Three Heroic Heathens”(also on the right), c. 1516, Metropolitan Museum of Art, New York. 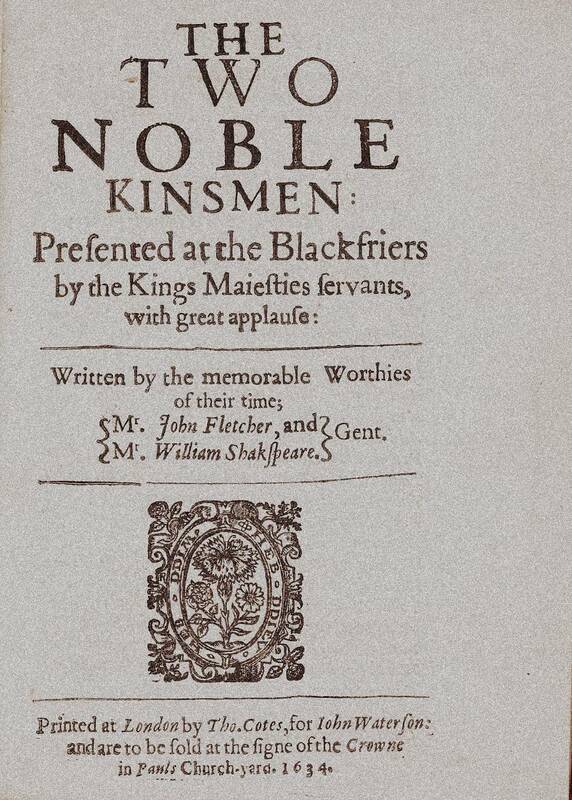 And then there’s Shakespeare, whose tragedy of Julius Caesar inextricably linked the iconic man with his assassination–and the date thereof. 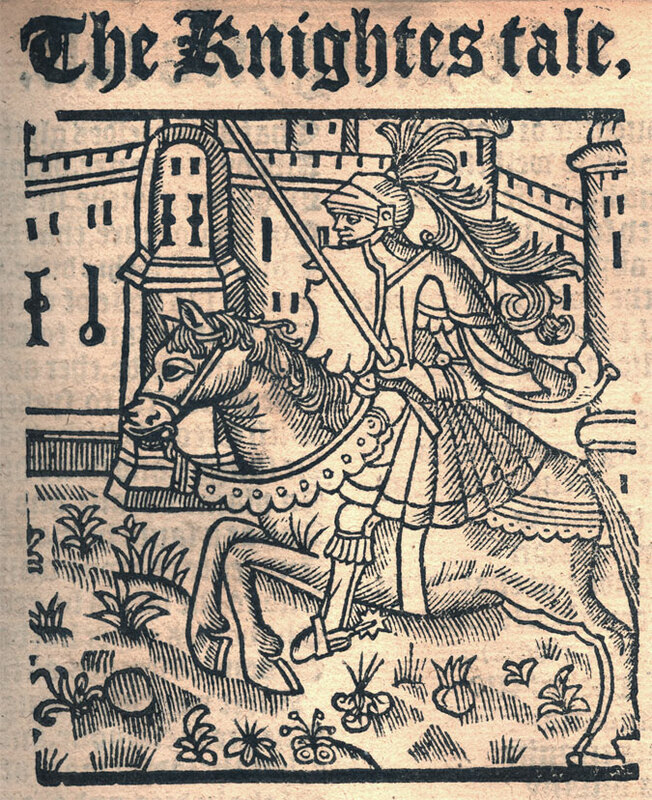 When you read histories of England from his era, the same histories that Shakespeare would have read, you can see why he would have wanted to add a play about Caesar to his English history plays: for the Elizabethans, English history begins with the Roman invasions of 55 and 54 BC, and this would be the framework for several centuries. 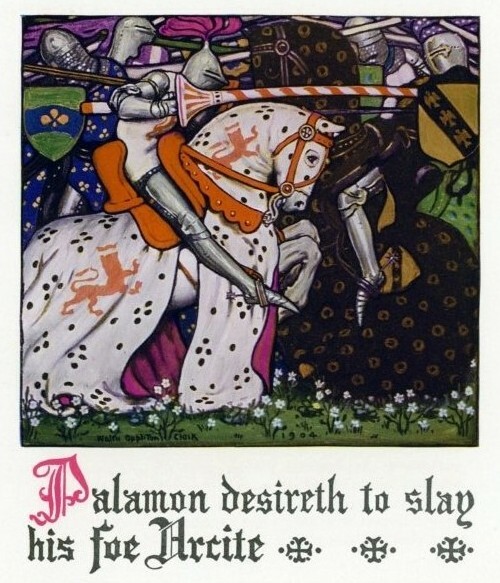 And during this time Britain would become an Empire, like Rome, with democratic ideals, like Rome: the life and death of Julius Caesar could serve as reference points for the emerging pax Britannica. 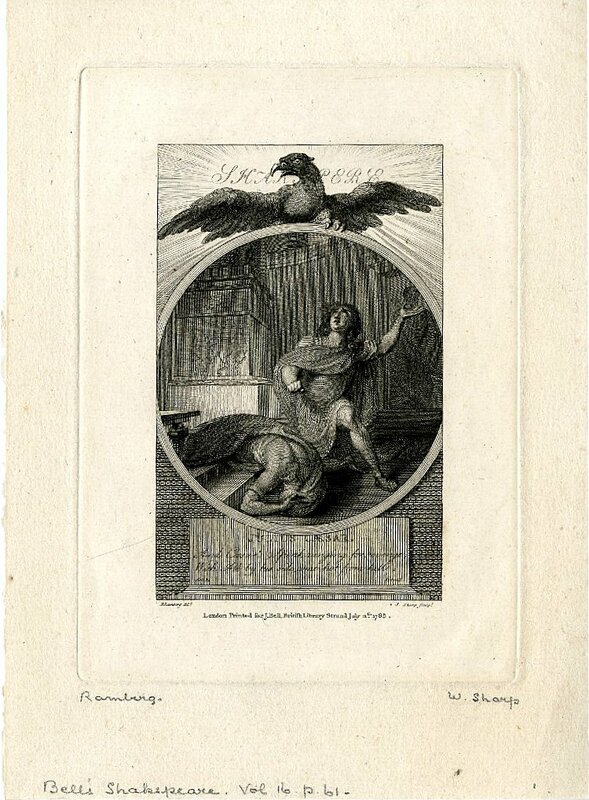 A 1684 edition of Shakespeare’s Tragedy of Julius Caesar; William Sharp print of the death scene of the play, with an avenging Antony kneeling over Caesar’s slain body, 1785, British Museum. 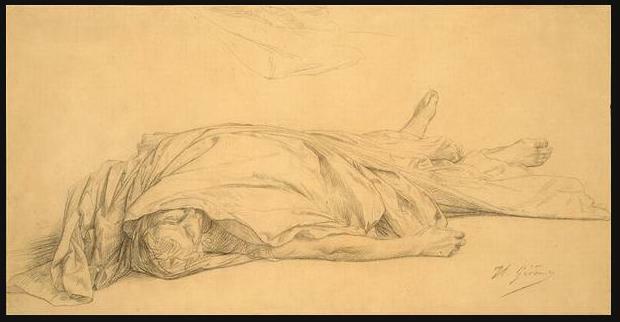 Ultimately it is the mutability or adaptability of Caesar (and his death) that explains his (ever-) lasting appeal: he represents triumph and tragedy, power and corruption, reach and over-reach. 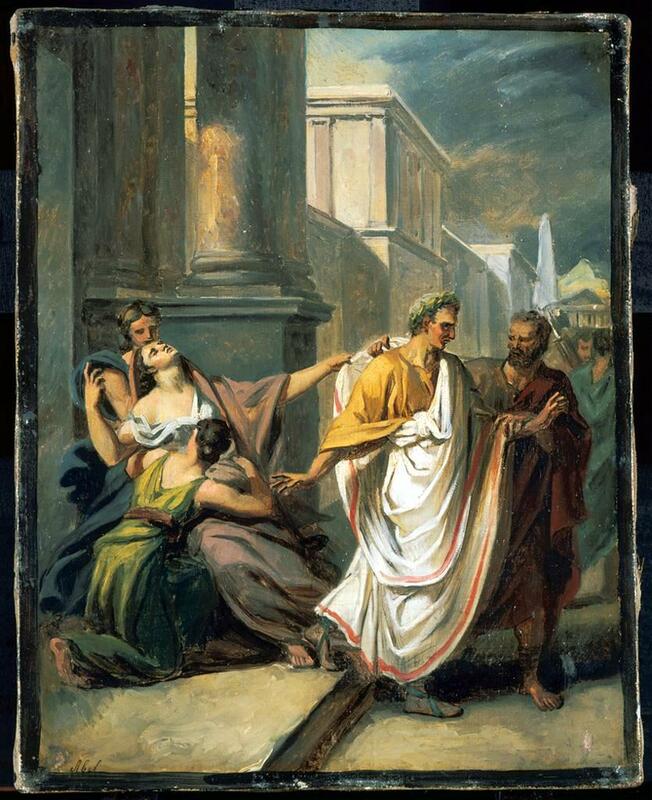 There are many romantic contradictions in Caesar’s story, which is why I think the French classical painters of the nineteenth century depict him most effectively–they certainly had their Caesars! But a Caesar could appear at any time, in any place, bringing forth another Ides of March. 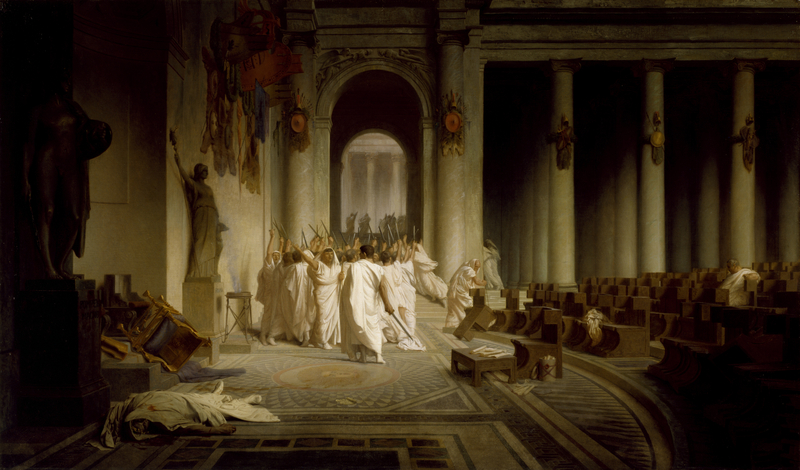 Alexandre Denis Abel de Pujol, Julius Caesar Proceeding to the Senate on the Ides of March, 19th century, Musee des Beaux-Arts de Valenciennes; Jean-Leon Gerome, Death of Caesar & sketch, 1859-67, Walters Art Museum; Puck cover from June, 1908 with a Caesar-like Theodore Roosevelt rejecting the crown of 1908 while that of 1912 hovers nearby, Library of Congress.